The 49.9 metre Benetti motor yacht QM of London is fresh from a major refit and is ready for the new season in ‘as new’ condition. Widely considered to be one of the finest superyachts in the Benetti Golden Bay series, she is ABS classed and MCA compliant for charter. 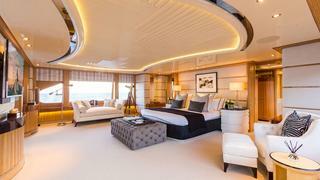 QM of London offers accommodation for 12 guests in seven cabins. 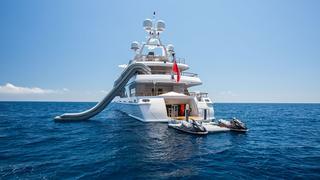 The spectacular owner’s suite runs the entire width of the upper deck, while on the main deck are two elegant VIP cabins with a further double and three twin cabins on the lower deck – a layout that has proved to be extremely successful with charter guests. QM of London's extensive 2014/2015 refit included a complete refurbishment of the interior and exterior, leaving her looking better than ever. 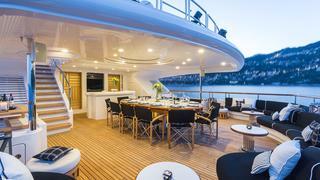 Her voluminous decks offer an array of spaces for guests to relax. Additions to her toy inventory include a water slide, Seabobs, jet board and Flyboard, along with a brand new 30ft Scorpion tender. As well as being an RYA accredited watercraft centre, QM of London's crew include a masseuse, yoga instructor, Flyboard and kitesurf instructors. 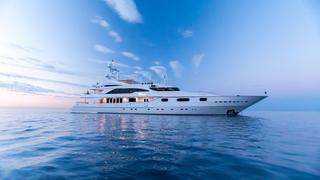 QM of London is available for charter through Y.CO at weekly rates of €205,000 in high season and €175,000 in low season.